The Warriors announced late Saturday that a chest X-ray and CT scan came back clear.All other tests, including an MRI, came back negative, the team said Sunday. McCaw was released from UC Davis Medical Center later Sunday. He will see a specialist on Thursday. The Warriors are calling McCaw's injury alumbar spine contusion. McCaw was placed on a stretcher and wheeled away with his neck stabilized. He was taken to UC Davis Medical Center for further evaluation. "I know Vince's spirit and his heart. I don't believe it was intentional at all," Durantsaid. "It looked like he was just caught in the middle of the play and wanted to move out of the way, but Pat was coming so fast. It was just an unfortunate play. Nobody in our locker room thinks Vince did that on purpose." Patrick McCaw goes up for a layup, and Vince Carter makes contact, sending McCaw to the court. 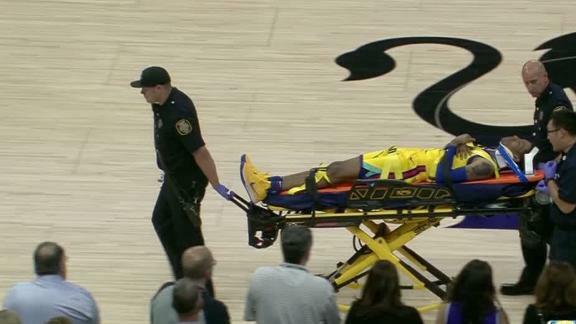 McCaw stayed down for several minutes before leaving on a stretcher. Both teams came together in a huddle before play resumed.